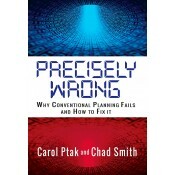 Why Conventional Planning Systems Fail, Precisely Wrong. At the heart of most supply chains lies a planning tool called Material Requirements Planning (MRP). Invented in the 1950s, codifed in the 1960s and commercialized in the 1970s, MRP became THE way of life for supply order generation and synchronization throughout the world. Yet the people that interact with MRP everyday know that something is very wrong. They may not be able to explain exactly why, but they know that if they did exactly what MRP told them to do, it would have disastrous consequences for their company and their career. What if there was one fatal flaw in MRP that makes it distort the relevant information that planners, companies, and supply chains are desperately seeking? What if correcting this one fatal flaw would allow the promise of MRP to be attained and the bullwhip to be effectively mitigated? Precisely Wrong: Why Conventional Planning Fails and How to Fix It will expose this fatal flaw and trace its impact to everyday situations encountered by planners and buyers and the larger supply chain. Additionally, an elegant solution to overcome this flaw will be revealed. Readers will walk away with a new depth of understanding about conventional planning systems and a list of things they can begin to implement the very next day. This work goes beyond the planning mechanisms of an organization and shows a roadmap for all levels to drive adaptation, protect and promote the flow of relevant information, and survive and thrive in the today’s complex and volatile environment. Provides an unique and simple view of the core problem underlying these systems, enabling a company to see a clear and relevant planning picture. Gives companies an essential description of the most known and pervasive issue in supply chain called the “bullwhip effect”, and how it relates to the core problem. Carol Ptak, CFPIM, CIRM, DDPP, DDLP, is a co-Founder and partner with the Demand Driven Institute. Ms. Ptak spent decades in supply chain management first as a practitioner and then as a consultant and software executive. She is also a past president of APICS, and has authored several books on demand driven methods, MRP, enterprise resource planning (ERP), Lean, and the theory of constraints (TOC). Chad Smith, DDPP, DDLP, is a co-Founder and Partner at the Demand Driven Institute. Mr. Smith spent over 20 years in supply chain and management consulting and software co-founding industry innovator Constraints Management Group (CMG) and working personally with Dr. Eli Goldratt. He has co-authored and contributed to several books on demand driven methods, MRP and the theory of constraints (TOC).